Knowing what grit of sand paper, and what to do with it makes a great paint job. Most automobile painters will agree that sanding is one of the most time consuming parts of the entire paint job. The more time you take in your sanding techniques, the better the end result of your paint job will be. I’m sure you have heard the expression; it’s all in the prep work. You can use sand paper from a da ( sticky on one side) as a wet sand paper by sticking two of them together. I prefer to use this sand paper for my 6 inch DA. Some will tell you that this idea uses more sand paper. But actually it uses less. When you stick two of them together, they become water proof sand paper. 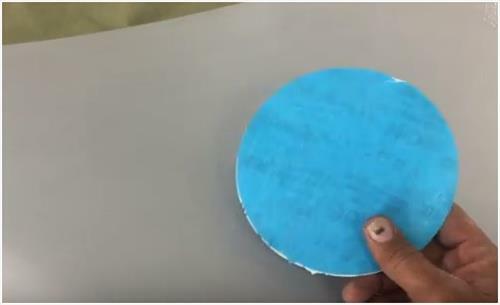 After you have used the sand paper several times, you can simply dip it into a bucket of water and rinse it, and it becomes practically new again. Moving it in the water will let all the primer that you have scratched off drop into the bucket of water. 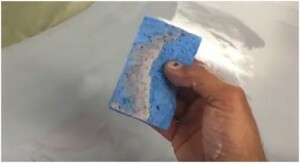 By rinsing your sand paper you will have saved money and time. With the bucket of water you will have saved several gallons of water. When sanding with a 600 grit paper, do not push to hard this will cause the paper to crinkle and absorb water. If you lightly scratch with the paper it will work more efficiently and it will last ten times longer. 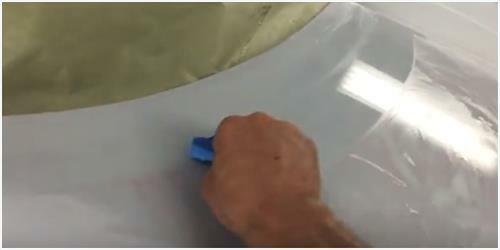 By using this method you can reduce the wet sand paper from 10 pieces to just these two. After you have sanded a area of one square foot, approximately. You will then wipe the area with a sponge. When wiping with a sponge, do not use a circular motion. Even wiping back and forth can leave particles behind. Start at one location, and wipe in a straight line. Do this until you have stopped at a gap, or edge of the metal surface you are wiping. At this point rinse the sponge. While it is under the water, move it back and forth so that any small and large particles remain in the water. After removing the sponge from the water in the bucket, squeeze the sponge as hard as you can to get all the water you can out of it. This allows you to have less water on the area you are cleaning, and allows the sponge to absorb a larger area of wiping before it needs rinsed again. Looking at the area you have sanded, is sometimes difficult to tell if you have hit it all. In this case wipe the area with your hand of fingers and if it is smooth, you have sanded it. But if it feels like sandpaper, then you have missed this area. This area will require sanding again. Once you have sanded the entire vehicle, the last step before painting would be to wipe it down with a tack cloth as seen here. Then you are ready to paint. I personally prefer the 3 m tack cloth. By wiping the vehicle down with this tack cloth, will remove any lint, grease, or foreign particles left behind. It is a very inexpensive way to ensure a perfect paint job. So in short. After you have sprayed your primer and it has dried. You will need to wet sand the entire area, wipe the entire area with a sponge. Allow that to dry. Then wipe the area with a tack cloth. Now you are ready to paint your vehicle. You helped me more than you could ever know. I’m going to watch all of your video’s and pick up as many pointers as I can. Thanks for taking the time to do them.